Take the first step to a happier, healthier life! The Standard American Diet (SAD) lacks nutrition, and our nation is in a health crisis. Many, right here in Douglas County, are afflicted by preventable diseases, such as heart disease, obesity, and diabetes, and are burdened by the cost and inconvenience of medications. This program will share simple, safe, affordable, and practical methods that result in health restoration. Learn about an optimal lifestyle, that includes personal health empowerment, natural movement, mindfulness, social support and the benefit of transitioning toward more whole, plant-based foods. Find out how you can make the change to a happier and healthier you! 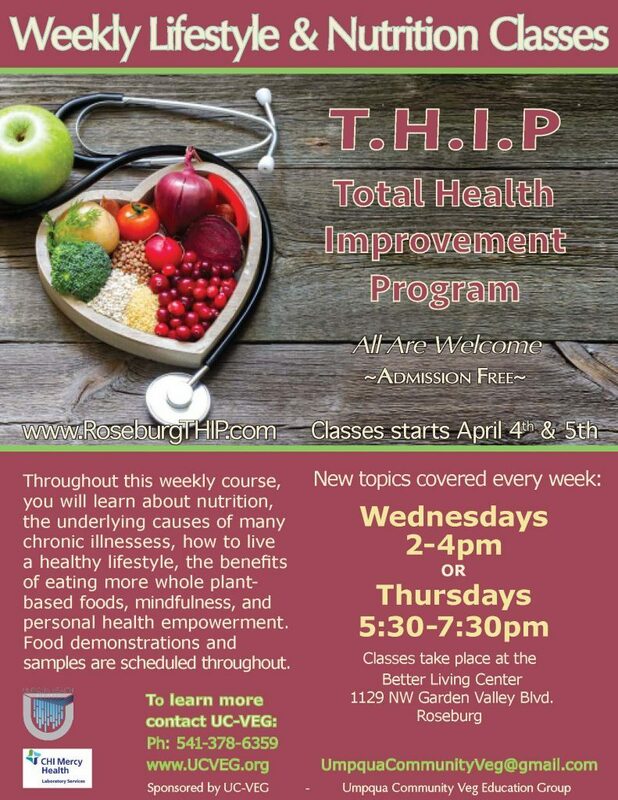 The Total Health Improvement Program is a 12 week, evidence-based, disease prevention and reversal series that uses lifestyle medicine to address the leading causes of death in the U.S. New topics are covered each week, including heart disease, diabetes, obesity, and other chronic illnesses as well as how to view and manage stress, mindfulness avoiding toxins and chemicals “moving naturally” or incorporating more exercise into the daily experience, and practical strategies for lasting happiness, all in a socially supportive atmosphere. The theoretical portion of the program is complimented with practical cooking demos, and sampling along with take-home packets of helpful handouts and easy and affordable recipes. Around 1,000 people have gone through T.H.I.P. in the last 3 years and have seen profound results such as significant weight loss, a decrease in dosage or even discontinuation or certain medications, lower cholesterol, lower blood pressure, improved mood and greater energy and vibrancy. Health improvements are verifiable through pre and post blood draws generously provided at the 2nd and 11th week of class by CHI Mercy. Over 40 (and counting) doctors and other medical providers around Douglas County are referring their patients to T.H.I.P. as a preventative measure and means to address the roots causes of illness that many are afflicted by right here in our community. It is of utmost importance to UC-VEG that the information contained in the 12 week course is disseminated to those that need it. Therefore, there is no fee for the course, though donations are welcome and appreciated. A team of facilitators, representing a diverse array of medical and professional backgrounds, serve as your guides on the journey through the Total Health Improvement Program. Our facilitators are contributing their time and expertise as a service to the community of Douglas County. While all materials for the class are provided, the book “How Not To Die” by Michael Greger, M.D. is suggested as the text book for the course. Students are encouraged to obtain their own copy, available for purchase in class for $18 or online for $15.00 – $27.00 plus shipping. 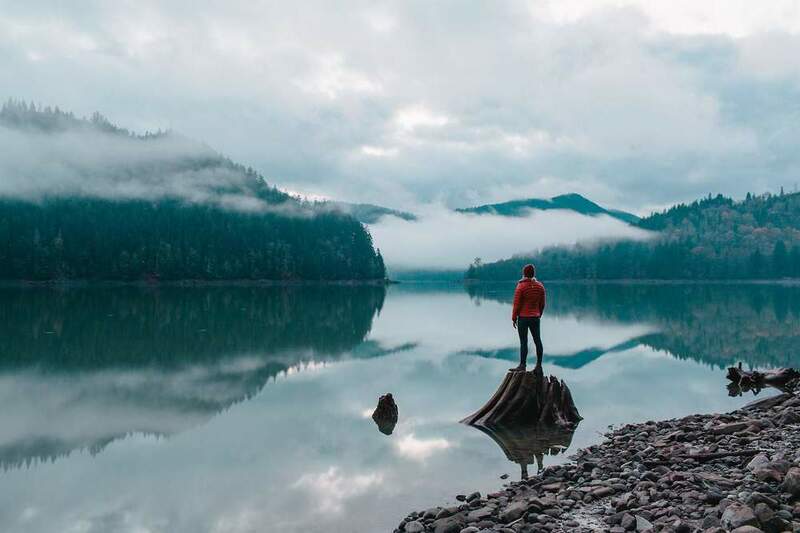 Participants that are on Oregon Health Plan will receive a free copy of the book, thanks to a generous sponsorship from the Umpqua Health Alliance. We look forward to meeting you at the start of the next round on Wednesday or Thursday. UC-VEG thanks UHA for leadership funding for THIP!